Lancing manager Mark Pulling wants his side to replicate the level of performance they produced against Hendon in the FA Cup for the rest of the season. 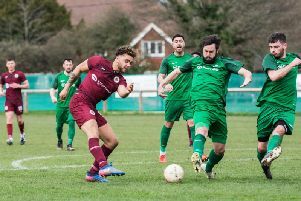 Pulling admitted he was proud of his side's efforts after they forced a second qualifying round replay with Hendon, who are 54 places in the football pyramid last week, before losing 4-0 yesterday. Lancers were looking to reach the third qualifying round for the first time since 1967 and speaking after yesterday's game, Pulling said: "I'm really proud of what the players have done over the last couple of games in the FA Cup. "Last week I thought we were absolutely outstanding with the performance but today it was probably just one step too far. "We had a 16-year-old playing left-back and it was only his second senior game in men's football. We had an 18-year-old playing right-back, the two centre-halves outside of Alex (Bygraves) are early 20s and then the rest of the team are early 20s all the way through. "I'm the oldest player and behind me is Matt Daniel, who is only in his mid-20s. "We're a very young team but they now know what it takes to get to that next level. "When you have a young side, you have to keep working at it and see where you get but they've set their standard in the last two games. "Come Saturday against Broadbridge Heath, they know what they've got to do to perform and get the win." Looking ahead to the rest of the season, Lancers assistant manager Danny Wood said: "We want to work our way up the table, especially now we've seen what levels the boys can play. "We're trying to push the younger lads through and threaten the places of the others to keep ourselves on top of our game. "If we start our season from now, I think we can have a good run until the end of the season." On the match yesterday, Pulling said: "We felt we were harshly done by for two of the goals. It was definitely not a penalty for their second and then we should have had a penalty at the end but the lino didn't give it. "The scoreline probably should have been 2-0. They deserved to win, you can't argue about that but we're proud of what we did." Wood added: "We worked hard but it's difficult playing against a team 54 places higher. "Two decisions went against us in the first half which ultimately cost us but the team worked really hard and it's something we can progress with in the next few games."